Judy (center) surrounded by fellow DEMers who gathered to celebrate her 50th anniversary. 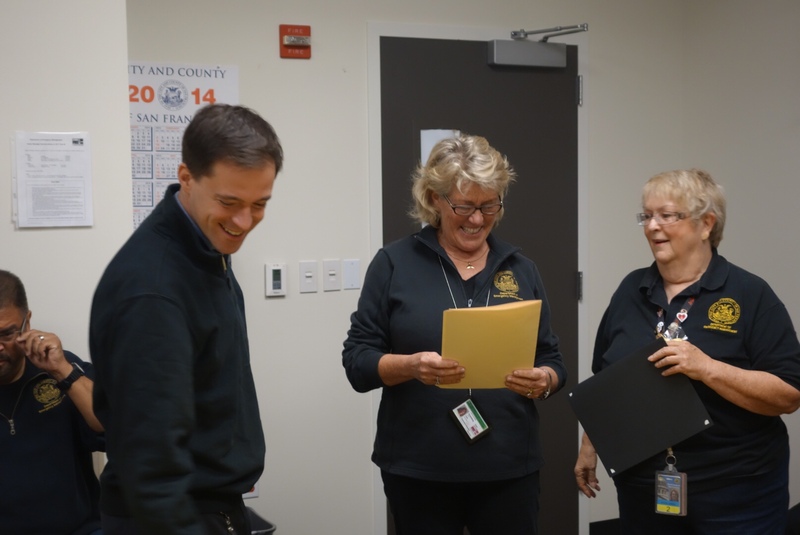 DEM is proud to honor Judy Hogan, our longest-serving employee for her 50 years of public service with the City and County of San Francisco. 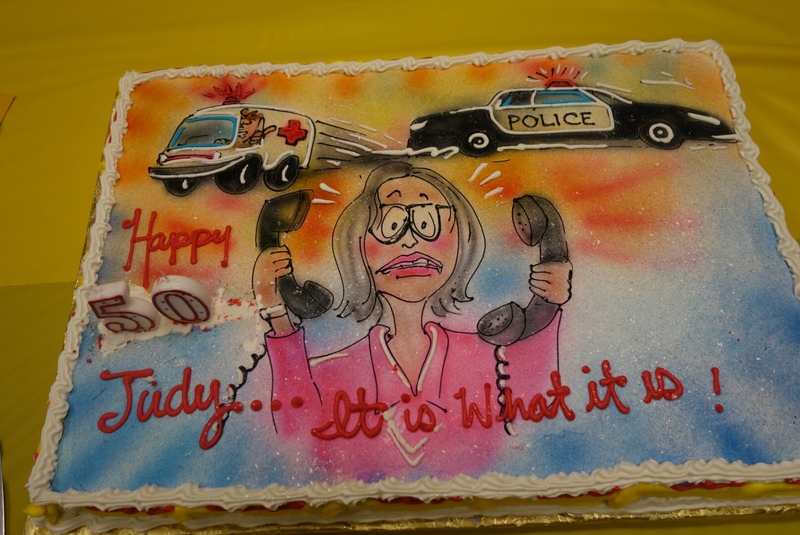 Having began her career with the City on November 12, 1964, last week Judy Hogan was recognized for her complete 50 years of public service beginning with the Main Library, followed by the Water Department, the Department of Public Health, and the Police Department, where she was a Police Service Aide at Richmond, Park, Central, and Mission stations. 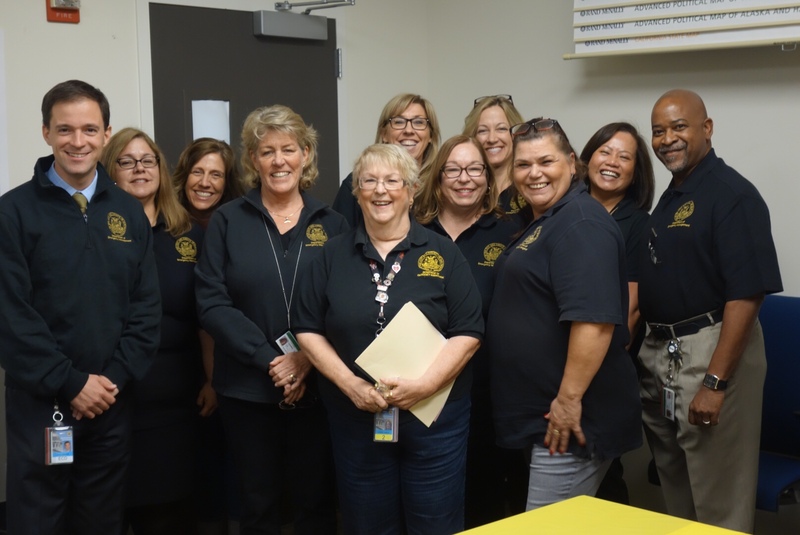 Judy first became a Public Safety Dispatcher in 1977, and has since served as a supervisor, training officer, administrative manager, and presently serves as an Operations Watch Coordinator. Judy played in important role in creating the unified 9-1-1 Center as it exists today, working to ensure that the public receives the help they need when they face an emergency. For the past two days I’ve been hanging out with some of the nation’s (and quite probably the world’s) top disaster researchers to discuss disaster communications. They invited me to provide a “from the field” perspective to academics; someone to tell them if the academic work has or will really impact those of us on the pointy end of the stick. For the most part the science really does support what happens outside the hallowed halls (I have to say that this group has a keen interest in pursuing projects that add value to both practitioners as well as academia, and I’m grateful for that). In fact, the research some of these people did formed the foundation of sf72.org. One of the things they asked me talk about was the ever popular “what keeps me up at night?” question (this question, and “are we ready?” seem to be the most popular questions for emergency managers…like asking clergy if the collar is uncomfortable). In formulating my answer, I came to the realization that, first: I really don’t get a lot of sleep for a variety of reasons; and, second: one of the biggest worries I carry around is a bit of a contradiction; I worry about our collective dependence on technology, while at the same time I’m constantly looking for more efficient and innovative ways to incorporate said technology into the response/recovery world. So what gives you ask? Has my cheese finally slid fully of the cracker? I guess I reconcile this dichotomy like this: tech is here, it’s part of our lives…and like all things it has mechanical components and dependencies that make it vulnerable to failure. And while I want big beautiful digital displays of stuff, I know that at some point we’ll need to bust out the crayons and butcher paper. So, the basic question is: how are people going to cope when the access to communication and information is suddenly stripped from our lives..cold turkey…for weeks? Have people thought about it? Tech is as natural as walking and is such an integral part of our lives that we risk personal safety to use it (yes, I’m referring to you…the one in the cross walk looking at your phone…really the debate on PBR v Olympia can wait 20 seconds). I admit I’m throwing stones from my glass house because I’m just as vulnerable. Between home and work, I routinely bounce between two smart phones, two tablets and multiple other computers…not to mention satellite phones, radios, and a host of AV stuff. Humans have always been tool users and it’s prety amazing that we’ve evolved from stone to iron to mechanical to digital tools in a relatively rapid sequence, especially the last 150-200 years (anthropologists: forgive my simplified summation of thousands of years of evolution into one sentence). Our tools have gone from devices to give us a mechanical advantage to ones that give us a cognitive advantage. In other words, we made tools so we don’t have to think. Don’t believe me? Do math with a pencil. What’s your best friends phone number? Heck, what’s your phone number? Do you know how to read a map and figure out your directions? Can you recite the preamble to the Constitution? These were all things that most of us could do without digital assistance not very long ago. My point here is that maybe we’ve lost some ability to function manually in the digital world. And again…I’m just as guilty (now I’m stuck on the Preamble dammit!! I had to learn it in 8th grade… Pushed aside by Buzzfeed and that eye searing picture of Kim Kardashian they posted, which suggests an off topic discussion of quantity vs. quality of information, but I digress…). So what to do? Building redundancy and making systems resilient is a never ending challenge, and the information networks of today are far less fragile than they once were. Nothing is fail proof though. That’s a simple fact of life. Even if the systems themselves are great (they’re not) don’t forget that those networks are interdependent with other networks: power, fuel, transportation, etc. It’s a lot like the old song about the thigh bone connected to the shin bone, but with all the ligaments, tendons, nerves and muscles thrown in. A failure in one or more of those components and you’re going get an up close understanding of how gravity works. Same holds true for our information conduits. After a major earthquake we know that roads will be damaged and access limited. Fuel supply lines will be interrupted from both the production and distribution sides, and power generation and distribution may be compromised at multiple points. Without getting all doom and gloom, it’s pretty safe to say at some point we’ll be dependent on manual means to do everything from find a phone number to open a can of soup, which we may have to eat cold (bleh). When’s the last time you wrote a document without a computer? Communicate with someone via courier or regular land line phone (no, you cannot simply drag the cord across the street so you can get coffee while on the call)? Read…or even held…a paper map? Bought something with cash? Got news/information without the internet? For a thousand reasons the networks we rely on every day can fail, and often times they do. Most of the time the systems come back on line before our batteries die, the deadline passes or we experience anything more than annoyance. We’re back to foodie photos and pet selfies in mere moments. But what if? What if the carriers can’t restore service in moments? What are you going to do when that restoration period is days or even weeks? How do plan to cope? I’m just saying you might want to think about it. Maybe look up sf72.org for some stuff you should keep on hand and then ask Siri to find a manual can opener and some battery powered reading lights (phone books are NOT backlit) that you can buy before the lights go out. I, for one, am going to make sure we have plenty of butcher paper, blue tape and crayons in our Emergency Operations Center. And a manual can opener (and maybe even a sterno…’cuz cold soup is kinda gross). 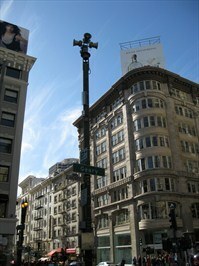 Most of us are familiar with what the City and County of San Francisco’s Outdoor Public Warning System Sirens sound like thanks to the Tuesday noon test when every siren booms for several seconds followed by “This is a test. This is a test of the Outdoor Public Warning System. This is only a test.” But hearing that siren at any time other than Tuesday at noon means something is awry. So, being jarred from sleep by an Outdoor Public Warning siren is scary—and then to find out there was no emergency is nothing short of annoying. Unfortunately, this happened in a handful of San Francisco neighborhoods late last Saturday night and early Sunday morning. And for this disturbance, we wholeheartedly apologize. As we engage in extensive diagnostic testing to figure out what caused the siren activation, we know many of you have questions about the sirens. So, in the spirit of using this wake up call as a learning opportunity, we’d like to offer the following Frequently Asked Questions regarding what happened last weekend, and about the sirens in general. Q: What is the Outdoor Public Warning System for? A: The City’s Outdoor Public Warning System is designed to alert residents and visitors of San Francisco about possible danger. Specific emergency announcements can be broadcast over any one (or more) of the 112 sirens which are located on poles and on top of buildings throughout all neighborhoods in San Francisco, Treasure Island, and Yerba Buena. Q: Why do the sirens go off every Tuesday? Q: What do I do when I hear the sirens sound Tuesday at noon? A: Take a moment to think about what you would do if confronted with an actual emergency and remind yourself to turn to traditional and/or social media for more information. Check out www.sf72.org to learn how to be prepared for any type of emergency. It’s a good time to register for www.alertsf.org and follow @SF_Emergency if you haven’t done so already. Q: What do I do if I hear the sirens sound if it’s not Tuesday at noon? On rare occasion, special tests are done on other than Tuesday at noon – we will make every effort to inform the public of the date and time before these tests occur. Q: Why did the alarm sound last weekend? A: The cause of the siren activation is still under review. Extensive diagnostic testing is taking place to determine the exact cause of the sirens accidentally going off. Q: Was this a planned test? A: No, planned tests take place Tuesday at noon. The cause of the unscheduled siren activation is still under review. Q: What if there is an emergency Tuesday at noon and everyone thinks the siren going off is only a test? A: Should an actual emergency take place Tuesday at noon, the Department of Emergency Management will send messages via traditional media (such as KCBS 740AM, KQED 88.5 FM), social media (@sf_emergency on Twitter, www.facebook.com/sfdem and Nextdoor), and if needed, first responders would canvas the areas impacted by the emergency. Q: What if I can’t hear or understand what is being announced following the siren going off? A: If it’s not Tuesday at noon, tune to traditional media such as KCBS 740AM, KQED 88.5 FM and/or social media such as @sf_emergency on Twitter, www.facebook.com/sfdem and Nextdoor. Also, those registered for www.alertsf.org will receive information about the emergency via email and/or text message from San Francisco Department of Emergency Management. Q: What if I can’t hear the siren at all? A: Registering for www.alertsf.org is the City’s emergency alerting system, so please register so we can send you emergency information to your email and/or text message to your phone. Q: What else should I do to get information about emergencies? Register for www.alertsf.org to get an email and/or text message about the emergency and tune to traditional media such as KCBS 740AM, KQED 88.5 FM and/or social media such as @SF_Emergency, www.facebook.com/SFDEM and Nextdoor. Q: How are the sirens triggered? A: The sirens are manually triggered by a Department of Technology technician positioned within the San Francisco Department of Emergency Management. Q: How old is the Outdoor Public Warning System? A: 50 sirens were originally installed in 1948. System was revamped in 2005 adding more sirens and voice capability. 112 sirens are in service now. Q: When was it last used for an emergency? A: It was last used in 2012 on Treasure Island to inform residents living on Treasure Island of a water main break and a boil water notice. Q: Aren’t these sirens outdated? Why don’t we just get rid of them? A: The short answer is that it’s important to have multiple alerting systems in the event one does not work. The silver lining in last weekend’s malfunction, is that while we were spreading the message there was no emergency in San Francisco, we also were given the opportunity to make San Franciscans aware of the numerous alerting systems in place, which in all cases include traditional media (such as KCBS 740AM, KQED 88.5 FM), social media (@sf_emergency on Twitter, www.facebook.com/sfdem and Nextdoor). Q: Why do I hear it during Sunday Streets? A: The siren is used in the neighborhood where that Sunday Streets took place to announce streets reopening to vehicle traffic. Q: How many sirens are there throughout the City? Q: How can I locate the siren closest to my home? A: No, the narrator is radio personality Dave Morey. Q: Will the alarms sound in the event of an alien invasion? A: Probably, but we’re pretty sure that…and a zombie apocalypse…won’t happen. 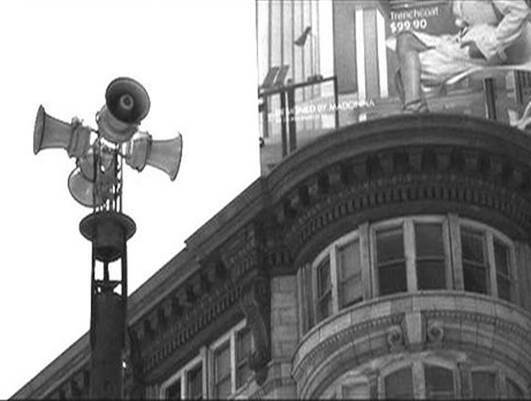 San Francisco, CA – The Outdoor Public Warning System Sirens throughout the City will be temporarily out of service this afternoon to undergo additional testing to investigate the cause of the activations experienced late last night and early this morning. The sirens will be deactivated this afternoon while being serviced. During this temporary maintenance window, should there be a need to alert the public of an emergency, the City will leverage its numerous emergency public information resources including the City’s text and email emergency alerting systemwww.alertsf.org, as well as traditional media and social media (via @SF_emergency and @SF72org on Twitter; www.facebook.com/SFDEM andwww.facebook.com/sf72org on Facebook; and on www.Nextdoor.com). Additional emergency public information dissemination strategies that can be engaged if needed include first responders canvassing impacted areas to ensure all are notified.